Not sure why. Not sure when this started. All I know is if it snows I find it necessary to bake bread. Last night Chris mentioned we would be getting a lot of snow today. Yes, I live under a rock. I was clueless! 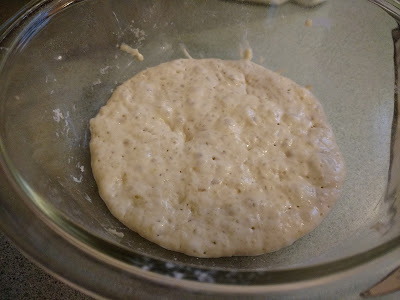 But the first thing that popped into my head was a bread recipe I had seen that required the Biga to be started the night before. If had paid attention I would not have been in the grocery store doing my normal weekly shopping with the "Gotta get milk and bread" shoppers. After securing my milk, I came home to bake bread. 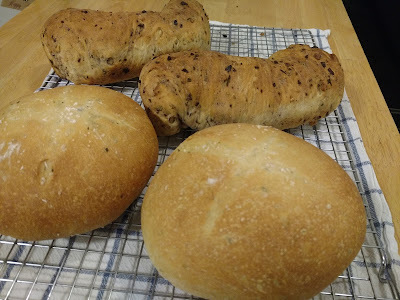 I continued the recipe I had started last night, Panmarino, aka Italian Rosemary Bread. The just kneading the dough was nice. The aroma from the Rosemary was heavenly. Here is the link for the Panmarino, aka Italian Rosemary Bread recipe. The other bread, oh yes I made 2 batches of bread today, was Walnut, Olive, Rosemary Bread. You see I had all that fresh rosemary from the Christmas appetizer wreath left over. No waste! This recipe was a little different. There was mention of olive oil in the ingredients but no mention of where to add it except for greasing the pans. 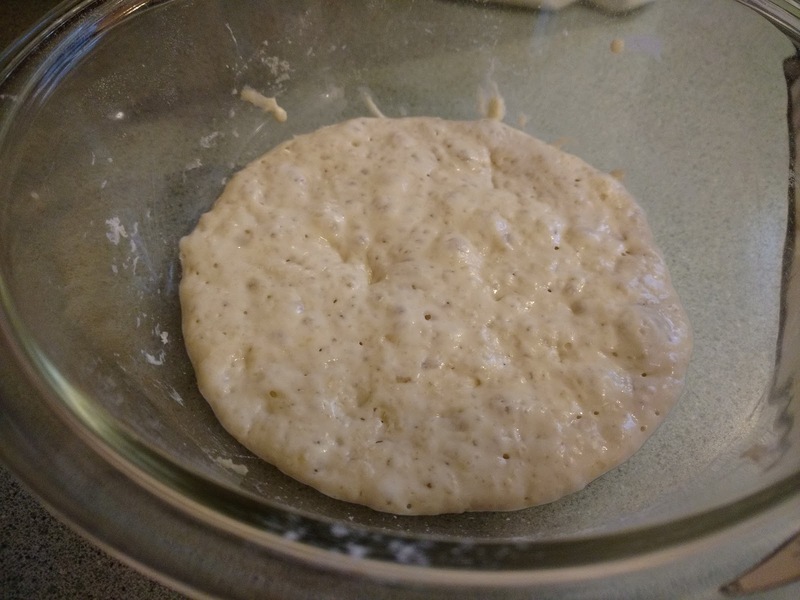 I ended up adding the oil to the dough along with more water and flour... quite the guessing game. But after all that the dough rose beautifully and the aroma was fantastic. 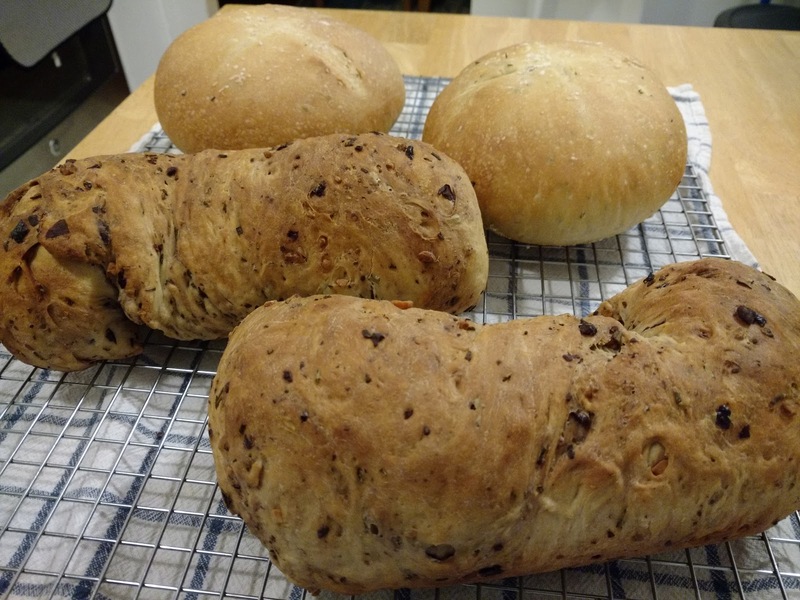 Both breads baked up nicely. I will report on the tastes later in the week.